There was a subtle bug introduced in Atmel Studio 7.0.1417 when attempting to debug a Cortex-M7 (SAME70,SAMS70,SAMV70). The programmer will alter the GPNVMBITs without user action and reason. This also reveals a problem with the default linker script that Atmel provides. The programmer changes the GPNVMBITs value to 0x82 everytime you go to debug. The SAME70 GPNVMBITS contains 2 control bits in bits 7:6, these two bits configure the TCM interface (Tightly Coupled Memory) which is a feature of the Cortex-M7 core itself. The TCM can be used to gain enhanced memory access performance for the core if configured properly both in fuse bits and in firmware. But the trade off is you lose access to chunks of “normal” SRAM that your firmware may still want at the “normal” addresses. 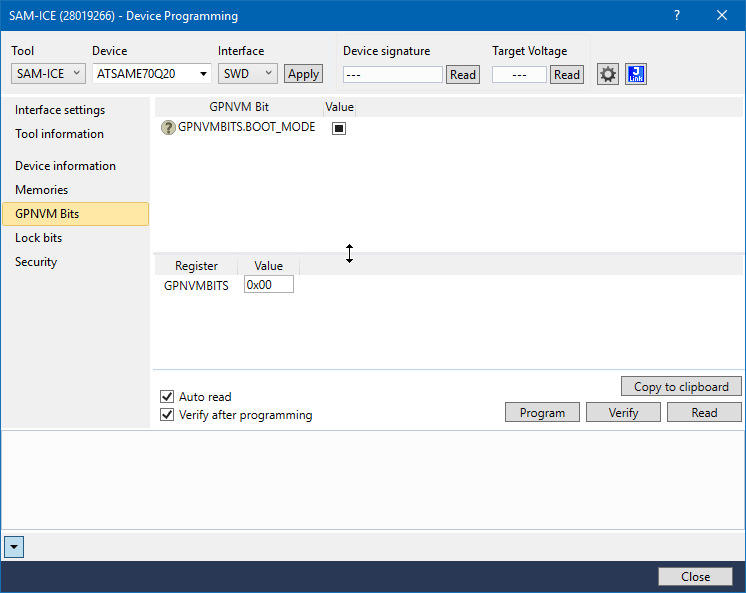 The default value for GPNVMBITS on a fresh microcontroller is 0x42. Bit 1 being set (0x02) causes it to boot to flash. Bit 6 being set configures the TCM to make 320KB of SRAM available. What happens when the programmer alters the value automatically? because the SRAM addresses it tries to copy to are no longer valid due to TCM setting, the microcontroller simply gets stuck. The default watchdog configuration being “on” will cause the micro to keep resetting, hitting the invalid memory address and repeating. It could be possible your firmware doesn’t immediately get stuck here because GCC did not allocate a variable in the now off-limits SRAM area. Fix the linker script to match the 0x82 configuration. This means limiting the SRAM to 256KB in length. But be warned, if they ever fix it, you’ll have to handle the default in a reprogramming step later on. Not a big deal as this should be part of any normal production flow to set the fuse byte. What’s the issue with the linker script that Atmel provides? Atmel’s default linker script declares 384KB of SRAM. However the default fuse byte setting is 0x42. Which means the micro only has 320KB of SRAM available. This will result in odd behavior if your firmware build under GCC decides to start allocating variables in the upper memory ranges. Either you correct the linker script to 320KB or you change the GPNVMBITS value to 0x02 which will give you maximum SRAM (384KB).